In the fall of 2011, for the first time ever, I had my grade one students blog using the KidBlog website. At that time their blogging was done during our weekly visit to the school's computer lab. They shared their writing with the world. There was no iPad access and no Kidblog iPad app either. However, their blogs clearly documented their growth in writing over the course of the school year. I was able to add a few other artifacts too. It was a great start towards a digital portfolio, but it was only a start. Three school years later my grade one students are still blogging but a lot has changed. Access to iPads and the KidBlog app have had the biggest impact on the quality of the blogs over the past few years. With the introduction of the app my students began to independently upload their work to their blogs. In fact anything that could be saved into the iPad/iPod camera roll (think screen shots, images of non digital work etc..) could be uploaded to a student's blog. Needless to say the blogs exploded with content. The KidBlog app made it possible for my students' blogs to move from simple blogs of writing, to blogs that share all types of learning. My students blogs have become authentic digital portfolios covering many areas of their learning. Late last school year I discovered that kidblog allowed my students to categorize their blog posts. 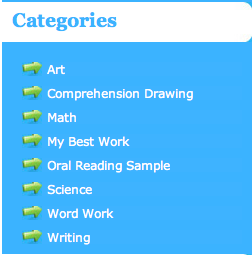 I started adding categories to their blogs to make it easier to sort their entries. But this all started late into the school year. This September my students learned about blog categories from their very first post, and have been using them since to categorize their posts. Since my students upload their content independently and also independently add categories to their post, it is much easer to find posts and see changes over time. For example, if their post is a math video they can tag it "math". If it's a personal writing sample they can tag it "writing". If it's personal writing sample about the science they are learning, they can tag it "writing" and "science". Later this week we have parent teacher conferences so in preparation my students will be tagging some of this terms work as "my best work". They will choose what blog posts they are most proud of this term. Their blogs are far better organized now making it even easier to see the growth over time. Kidblog has other features that I am taking advantage of to create authentic digital portfolios for my students. 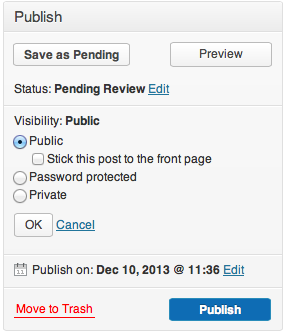 Another feature I am using more often this year is the "private post" option. Let me explain why. With all this independent uploading and categorizing some of my students upload content that clearly shows that they do not understand a concept. In the past when I received blog posts that were filled with obvious errors and I was not really sure what to do with them, particularly with math concepts where the errors were quite obvious. I'd often let them through for the world to see. But the more I thought about it the less I liked that idea. I do feel it is very important to document the learning that is not correct. It helps to show growth over time. However I no longer make these posts public to the world. My students now have many blog posts that are published privately. A private post is post that only I or they can see when they are logged into their account. It allows only those that should see the posts see them. I strongly believe that these "error" posts are equally as important as those posts that don't contain "errors" but I don't think the world needs to seem them. By utilizing the private post feature the digital portfolios are safe places to share errors in thinking too. The other thing I like about private posts is that at times I have students who want to blog about personal topics but they don't want those posts to be shared with the world. Making those individual posts private is the perfect solution. The final feature of kidblog that I am using more often these days is the private comment feature. 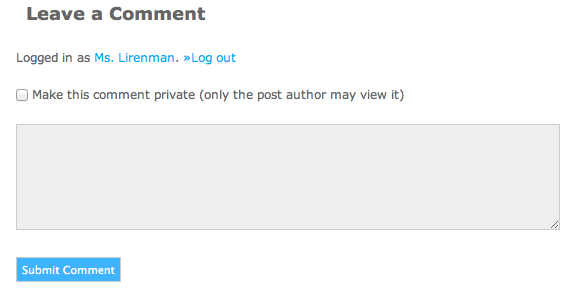 Kidblog has a feature that allows you to leave a "private" comment to the author. Like the private post, the private comment is only seen by the author of the blog, and only when they are logged into their account. While my students are still developing as readers, I am able to leave simple comments that help redirect their learning. It's yet another way I can provide authentic feedback to my learners. 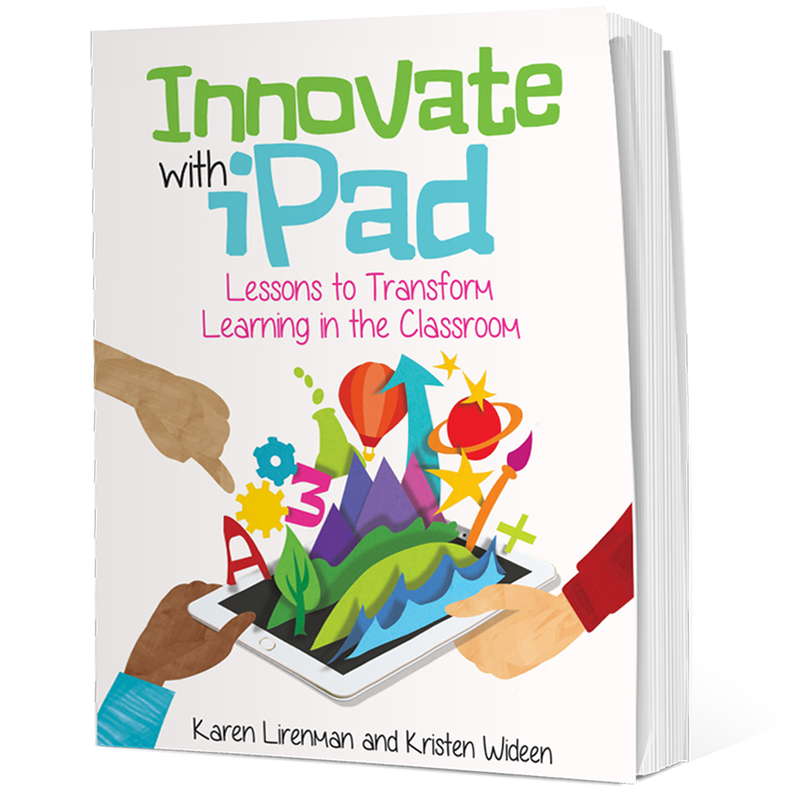 How are you using the Kidblog features to create authentic digital portfolios? You can check out this years student blogs here. Please feel free to leave them a comment or two. Thanks for sharing this Karen. I was unaware of these features of Kidblog so now I will look into how to use them for my own class. Excellent suggestions! Are these features available through a paid subscription to the site? Thank you. I'm glad you've found my suggestions helpful. I think they are available through all versions as they were part of kidblog when it was completely free. Thanks for sharing, Karen! 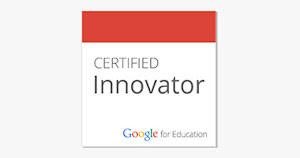 These features are also on Edublogs. I love how you explain how you've used them to create their digital portfolios. I had never thought of using the private posts and comments to help kids grow into readiness for a world-wide audience. I think that's a great idea. I have used categories though. In addition, I've used separate pages for the different subjects--it's a little more work. Maybe for older kids. Kidblog and Edublogs are both WordPress powered, so I like to think the three can easily take a student from K-12. Thanks for sharing your knowledge. You are my mentor! My kids are using kidblog more and more to document their learning. I love the idea of private posts and comments and also organizing their work. Definitely something I will look into. I have noticed that the space in Kidblog is filling up - do you pay for your subscription or do you still use the free version? The paid version has a lot of space and some more options. I couldn't live with the space in the free account. I have not used these. Great suggestions.